The 1812 Plus is an updated version of the 1812 Classic and features an upgraded processor, a new high fidelity digital voice circuit, better volume control, a lighted push-button and additional call out telephone numbers (up to 27). 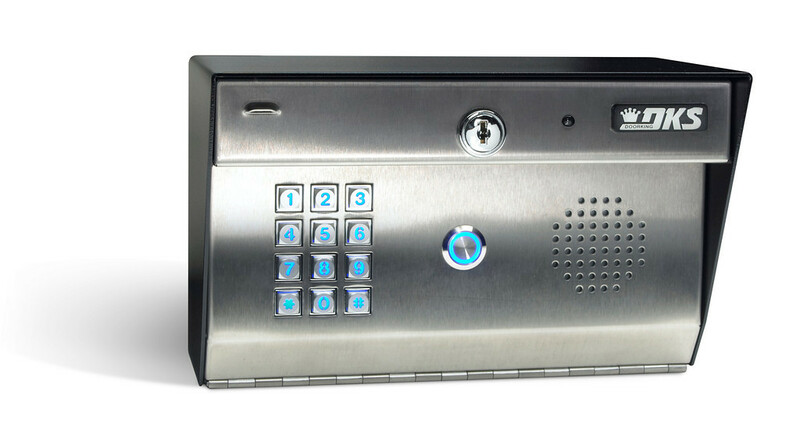 This unique communication and access control system allows homeowners to use their existing telephone as an intercom to speak with a guest at a door or gate and is ideal for those applications requiring a basic, single door or gate, access control solution. Four "hold open" time zones. 10 Tempory entry codes with start and end dates. Connects directly to your existing C.O. (Central Office) phone line. No additional monthly expense for a separate telephone line to the entry system. Digital voice circuit for cyrstal clear communication. Unique double ring identifies calls from the 1812. Two relays allow control of two doors or gates. Answer machine bypass feature allows the homeowner to call the 1812 from an off site location and "by-pass" a home answering machine to perform programming operations. Built-in call waiting so calls from the access system are never missed - even if you're on the phone. Call forwarding - never miss an access system call, even if you're away from your home. And you can even create a time zone for when you want your calls to be forwarded. Dial-out function provides up to 27 alternate phone numbers for the system to call. Do-not-disturb feature allows the homeowner to set times when the access system will not ring the house phones. Program up to four "hold-open" time zones to keep your door or gate open during certain times of the day. Program up to 50 individual five (5) digit entry codes. You can even time zone restrict certain entry codes. Program up to 10 temporary entry codes with start and end dates and time zone restrictions. Great for allowing service companies entry to your property. Special intercom programming mode allows the 1812 to be connected directly to a PBX or KSU phone system. 1812 Plus Programming Method: System keypad or touch-tone telephone.